There are just some color combinations that calm you down. Blues, greens, ivories and whites are the perfect combination for a calm yet excited bridal party. Naturalistic design and visual impact with intricate textures creates dramatic impact while the colors cool everything down. 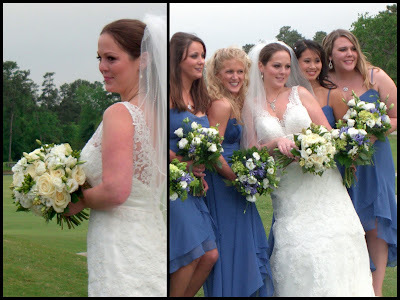 These blushing attendants carried bouquets with agapanthus, hydrangea, blueplurum, lisianthus and a mixture of greenery, while the bridal bouquet was intoxicatingly fragrant. Her flowers included traditional garden roses, lisianthus, ranunculus, tuberrose, hypericum berries and a touch of greenery to frame it out. 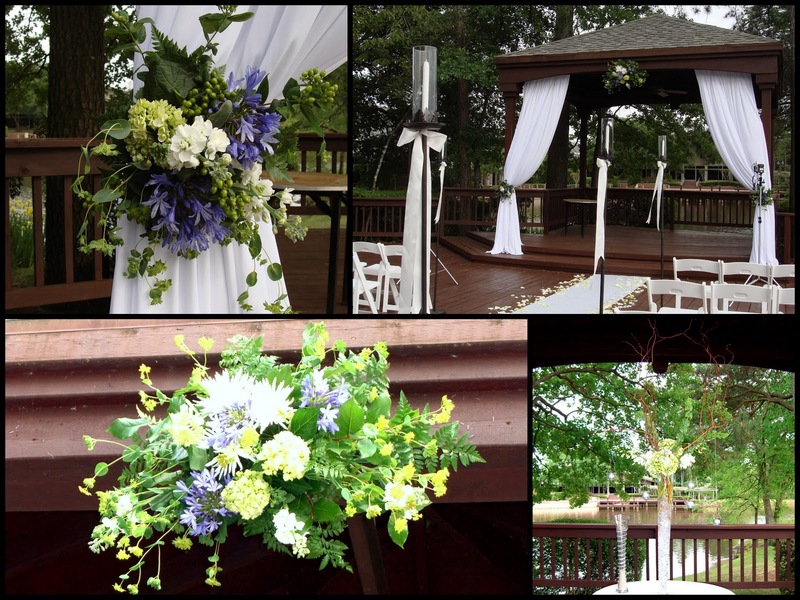 The ceremony was held on the Forest Deck at The Woodlands Resort and Conference Center. This is one of my favorite venues for an outdoor wedding. It looks over the golf course and creates an absolutely stunning natral backdrop. 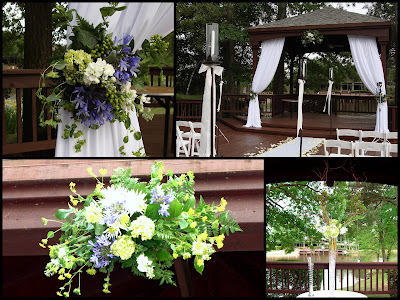 We used the same cool color scheme with the greens, blues and ivories for the Gazebo decor, which when paired with the white flowing curtains creates a beautiful softer more formal setting for a sacred ceremony. We also double purposed the couple's unity table arrangement with hanging candles, hydrangea, curly willow and bells of ireland as their sign in table arrangement for their reception. The reception was held in The Glass at The Woodlands Resort and Conference Center, which continued their natural setting theme with walls of glass looking out over the water. 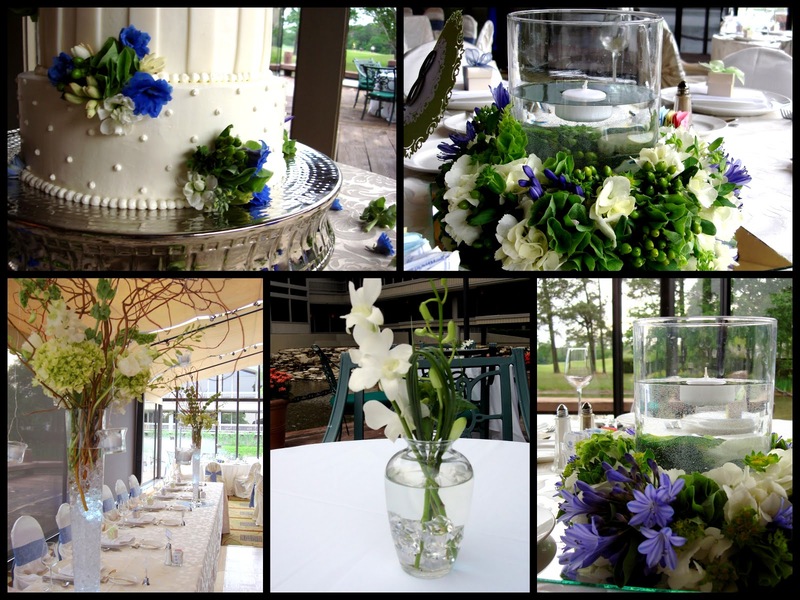 Every detail was cared for with beautiful centerpieces of wreaths filled with beautiful flowers and hurricanes with floating candles. The head table was dressed up with tall arching arrangements filled with curly willow, stock, bells of ireland, hydrangea and hanging tea lights. The vases were filled with crystals and underwater lights creating a soft glow for the bridal party table. The colors, the setting and the beautiful bride made this event truly memorable.